On my recent cruise to the The Greek Isles, the itinerary included a 5 hour stop in Dubrovnik, Croatia. I knew about this breath taking, UNESCO World Heritage site, from reading travel publications and interestingly, word of mouth. Dorina, my Croatian hair stylist, an avid traveler and fellow jew, said it was the most beautiful town in Europe period! She was overjoyed when I mentioned we’ll be stopping there and gave me some tips for the ‘must see’ sites, knowing my passion for all things Jewish, especially the little known and ancient. On day four of the cruise, I awoke at 7 AM and ran to my stateroom balcony to look out at the stunning loveliness along the coastline of the Adriatic Sea. The blue water surrounded the stunning panorama of the walled Medieval city of Dubrovnik. I remembered with excitement that there was more to this great beauty justly named ‘the Pearl of the Adriatic’. Dorina shared a little known fact, that only few may know – in the heart of medieval Old Town, stands the oldest functioning Sephardic synagogue in Europe. I sent her a mental blessing, and got ready to grab breakfast and to disembark at 8:00, notes in hand. The Jewish tour guide we hired spoke good English and was passionate about her vocation. She had the perfect balance of historical knowledge and appreciation of the stunningly preserved Medieval city. Her fascinating stories added greatly to what I had spent hours learning prior to this trip. As we walked past the Venetian style buildings, marble squares, fountains and stone palaces, the ancient streets took on a life of their own. At one time, many of these properties belonged to members of the thriving Jewish community. However, they were not permitted to live in them until emancipation by Napoleon. Nevertheless, most physicians of the city were Jewish, they were ship owners, and accumulated wealth and respect. They were the main importers of wool and spices from the East and textiles and paper from the West. The Jewish community traces back to the 15th century, when several Sephardic Jewish families, following their expulsion from Spain, decided to remain in Dubrovnik, rather than continue to Turkey. They helped solidify a small yet strong community in the city. Eventually, in 1546, the valuable contribution of the the Jewish population, led city officials to allow legal settlement within the city. The Ulica Udiosca (street of the Jews) was established within the fortified walls and in mid 17th century the oldest Sephardic synagogue was established on the second floor of a 14 century building, at Ulica Udisca 3. The visit to the synagogue is definitely a highlight of the visit. Even the way to get to it is gorgeous, passing thru Pile Gate, head east down the Main Street of Stradun, an impressive pedestrian promenade which extend to the other end of town, where The Clock Tower and Small Onofrio Fountain can be seen. But before far, making a left the Street of the Jews, is the Gothic/renaissance style Sponza Palace. There, just a few steps up a narrow stairway, stands the small but gorgeous synagogue, with the Jewish museum on the left side. Not only is it the oldest functioning Sephardic synagogue in Europe, but the second oldest synagogue after Prague, in all of Europe. The Dubrovnik synagogue is built in the Italian baroque style, in 1652, with elegance of workmanship, an elaborate chandelier, colorful textiles and gilding. It’s divided by three arches with the bimah located under the central arch. The Aron Hakodesh, is facing Jerusalem and is surrounded by the remaining two arches. The Jewish museum became the very first in Croatia and contains several small exhibits: archival documents: a Holocaust memorial: a collection of religious objects, such as some elaborate Italian , Spanish and French Torah scrolls, hailing back to the period between the 13 -17th centuries. Also, various Torah covers are exhibited, made from silk and decorated with 17 century gold embroidery. The least known unique Jewish site I located upon exiting the city walls, just outside Pile Gate. It’s a modest water fountain that now serves the locals. The story goes that before Napoleon’s arrival in Dubrovnik Jews were not allowed to drink from the other two fountains in the city. They were restricted to the “Jewish Fountain”, as it’s still called now. After the napoleonic emancipation, Jews were able to drink from any fountain, as due to equal citizens. This entry was posted in Jewish History, Travel Experiences on April 21, 2014 by slAdmin. Barcelona, one of the loveliest cities in Europe, nestled on the shores of the Mediterranean Sea, and not unlike the city of Haifa in Israel, is framed by green mountains on the other side. It is the capital of the independent Spanish region of Catalonia, with a population of 1.5 million. It’s main intersection, Las Ramblas promenade, runs from the waterfront, and is filled with street performers, flower stands, shops and markets, overflowing with an exquisite array of fresh produce, fruits and vegetables glistening with ‘just picked’ colors and scents. A walk along Las Ramblas (plural, for the intersecting streets, many of which lead into highly varied neighborhoods, filled with architectural delights from Roman to Gothic. For Jewish travelers the most exciting thing is often the realization that the Jewish community is undergoing a rebirth, after a painful hiatus forced by on them by the Spanish Inquisition, public burning of all Jews who refused to convert to Catholicism and the expulsion of 100,000 Jews. There is a long and blood stained history of Jews in Barcelona, which began after the destruction of the Second Temple in 70 C.E. There was an ongoing Responsa (A body of written decisions and rulings given by legal scholars in response to questions addressed to them. It pertains historically, to religious law), between the Babylonian Rabbis to those in Barcelona. Thus the integrity of the connection to the highest source of Rabbinic studies was maintained and created the base of a flourishing of Jewish learning. Diring the 12th century, renowned Jewish Spanish traveller, Benjamin de Tudela, wrote of his arrival in a “small and beautiful city on the shore of the sea” and reported that a “holy Jewish community, with mighty princess of commerce” we’re residing there. Jewish learning flourished in the region. In the 13 the century, one of our greatest and most important scholars, Moses Ben Nachman, also known as Ramban or Nachmanides, was ordered to debate a Dominican priest on the validity of Judaism vs Christianity . The debate was conducted in front of King Jaume I. It was called the disputation of Barcelona and Ramban was so persuasive the King awarded him a monetary prize and praised his brilliance and courage. Then the King, who was obviously unusual in his thirst for knowledge and truth, attended a Jewish service in Barcelona’s Sinagoga Mayor. The Rashba, another great scholar served as the Rabbi of the Sinagpga Mayor for 50 years, writing thousands of Responsa, and prohibiting the study of philosophy and science by Jewish men before the age of 25. (1235-1310) By mid 14 century, a quarter of the population in Barcelona was Jewish, mostly crammed into the old Jewish quarter, El Call. Scholars,writers, merchants bakers and bankers lived there, having significant influence on both Christian and Jewish commerce and intellect. The population flourished and produced some great scholars and people of wealth and influence. On august 4 th 1391, El Call was attacked, with at least 200 Jews murdered, the synagogue and Jewish properties were confiscated. Things became so devastating that about 100,000 Jews would leave, prior to the start of the Inquisition. About 4,000 of the Jews in Barcelona decided to convert to Christianity, rather than lose their positions of power and wealth. They did so ambivalently, many living a double life and practicing their true religion in secret. The most ironic fact is that some of the reasons the Inquisition came about, is because Spain’s church leaders were furious and decided to use torture and any means to force the truth out of the new Conversos. A thing as minor as using olive oil rather than lard would give them away – and their obedient Christian neighbors made sure to report any such observation. Barcelona became a city without a Jewish population for hundreds of years, but in the end of 1800, Moroccan and Turkish Jews were the first to return. In 1909 the law prohibiting the establishment and worship in synagogues was overturned, and a congregation of 100 or so Jews lived in the city by 1918. With the rise of Franco and the Spanish War, some 5,000 drifted to Catalonia, and Spain provided refuge for Jews, paradoxically, under fascist Franco. In fact none of the Jews who lived in Catalonia were shipped out for extermination. In the 1960s South American immigrants of both Sephardic and Ashkenazi origin immigrated to either Madrid or Barcelona to escape political repression. Speakers of Ladino were especially aided and encouraged. Today Barcelona’s Jewish population numbers 5,000 and in 1954 the Communidad Israelita established the first free standing Jewish institution on the Iberian peninsula, following expulsion, with two places of worship. One representing the more traditional Sephardic Orthodox population, and the other synagogue caters to the Ashkenazi. There is a presence of the Chabad Lubavitz Center of Studies. Barcelona has become home to the very first Reform synagogue in Spain in 1997: the Communitat Jueva Atid holds Shabbat morning services and has 400 members, most of Argentinian immigres. In 1956 there was a huge influx of Morrocan Jews, returning to the land of their ancestors. The community has a Jewish publishing firm called Rio Piedras, which specializes in the history of Spanish Jewry. The community runs Sephardic cooking classes, Ladino and Klezmer music concerts and an international Jewish music festival. I heard of a deeply touching event, which happened in recent years and brought tears to the eyes of many, including myself. It concerns the “return, or rebirth) of 5 Conversos at the magnificent Sinagog Mayor. Rabbi Ariel Edery read excerpts from a 15century Siddur, written in ancient Catalan and Hebrew, which was discovered during an excavation under the foundations of the newly restored synagogue. This Shabath service, the 5 men, former Catholics, completed their conversion to the sacred religion of their forcibly converted ancestors. they were called up to the Torah to chant their first Aliyot. The whole congregation was in tears as the men chanted. They all traced their lineage centuries back to Spanish Jewish ancestors Jewish sites. In El Call, located at the corner of sant Domdinscriptions dating from further back than the 14 the century, can be faintly made out, in the stone walls. Near the cathedral on San Jaume Square (I believe named after the King who defied the church centuries ago, by honoring Jews and their religion), there can be seen the letters nun, vet and tag on the worn bricks. The letters are so faded, they must be pointed out to be seen, and to that end community leader Dominique Blinder, an architect from Argentina. Started Urban Cultours.,began organizing Jewish tours. The restoration of the city’s medieval synagogue in the historic Jewish quarter, has now added Barcelona to an important place to visit, aside from Toledo synagogues, the ruins of Rambam’s house and Girona, the medieval center of mysticism and kabbalistic studies, despite it having no functioning jewish community today. Barcelona has the largest concentration of Jews in Spain, two functioning synagoes, an emerging academic investigation of past glory and historical reservations. It also has one of the most unique cross pollinisation of the Jewish tribe, outside of Israel. Like most of El Calls buildings most original construction were torn down after the expulsion but their materials were recycled in the city. The remaining structured where Jews once led their life are stark and simple and lack ornamentation in sharp contrast to the architecture in the city. Mortjuic, mountain of Jews can be reached cross harbor cable from the seaside part of Barcelona or by bus no 61. It had a Jewish cemetery for at least a millennium. In 1956 a Jewish memorial was erected there, commemorating the Holocaust. The Picasso museum is just outside Ell Call, rambling thru several gorgeous medieval palaces. If there is any time left, a visit to Gironia is recommended to visit the center of Jewish learning in Spain in the 13 the century, and the place where Kaballa first made its appearance in Spain, where great scholars like Nachmanides contributed their genius to the development of mysticism. This entry was posted in Jewish History on April 2, 2014 by slAdmin. I was 12 when I saw my first Chagall. Walking down Dizengoff Street in Tel Aviv. Ice cream in hand, I stopped short. In the window of a gallery, a magical painting took my breath away. I got my first taste of an original Chagall. The memory is so vivid, I can recall it in detail. I stood there, mesmerized by the indescribable beauty, the depth of emotion and passion. We just learnt at school about the pogroms in the Russian Shteitels, and they were deeply disturbing to me. I remember standing in front of that window for what seemed like an eternity. I became one with the soaring figures, transported to the little village below. Then, hugely embarrassed, I burst into tears. The colors were magnificent, the couple, in flight, fueled by love. Yet down below, reality awaited them, but they were momentarily oblivious. I had a huge lump in my throat for these lovers who floated in space to unite with a kiss, despite, strangely, being tethered to the ground. Could have all been my very own interpretation, but all told, I became obsessed. I began to seek out everything I could on the artist and his masterpieces. Mark Zacharov Chagall, a Russian-French artist (1887-1985) was referred to by famous art critics as “The quintessential Jewish painter of the twentieth century”. I found that many think of Marc Chagall as the creator of folksy figures soaring above old world villages, surrounded by ghostly fiddles, big colorful bouquets and animated animals. Art critics have knocked him for being too sentimental or capricious. Regardless, Chagall became iconic for his mastery of color, myth and spiritual tradition. But what caught me that very first time, (though I don’t believe I could have verbalized it) was the darker aspect of this master, making a political, even pessimistic statement, all while imbuing the image with magic and fantasy. He fled with his wife Bella and daughter Ida following the Russian Revolution and his works, though imbued with fantasy, reflect the underlying sense of painful unrest, the result of his uprooting. The colors he used during this period, grays, blacks, blues and a surprising violent streak of red, which are in contrast to his normal palette, casting a dark shadow over life in Paris. Yet the Jewish spirit is evident in all the works….even the most political pieces are expressed thru fantasy, like the grandfather clock with the case of the itters or the the rooster in evening attire. Chaggal is quoted saying “Without mystical element, is there a single great picture, a single great poem – or even- a a single great social movement? He worked in every possible medium, oil, glass, ceramic book illustrations and tapestries. His stained glass windows grace the cathedrals of Reims and Metz, the Windows for the UN, and the Jerusalem Windows, in Israel. The Paris Opera house’s ceiling is decorated with an exquisite large scale painting by the artist. In 1941, as the Nazis became pervasive, Chagall moved to New York City with his family, driving him further away from the village existence he knew and loved. 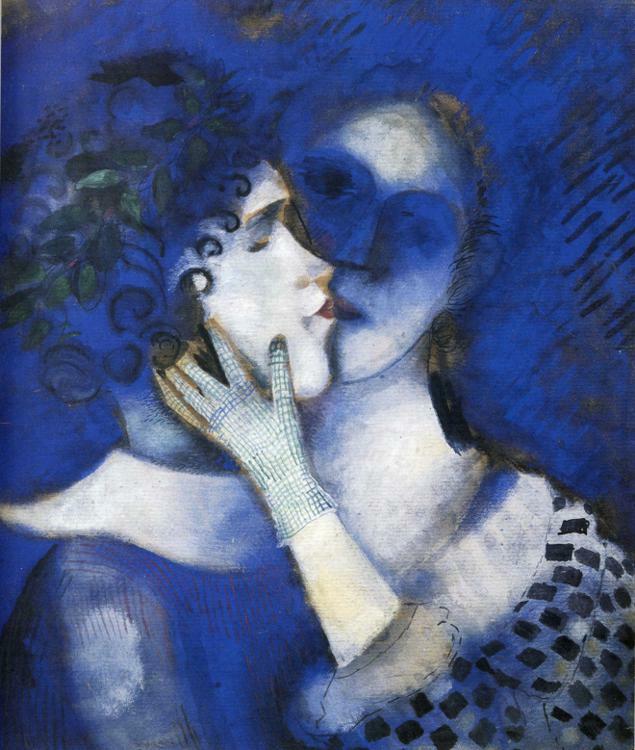 Religious imagery,of the dark and violent kind reappeared constantly throughout Chagall’s paintings, communicating his suffering. In 1944 Chagall’s wife suddenly passed away, driving his artistic vision into even darker and more confused territory. Though he remarried quickly, the longing for his true love was evident in the works he produced. Marc Chagall is the most fascinating artist, always expressing his deeply-felt Jewish spirit in his art, catching the observer in the deepest place, where the heart lives. This entry was posted in Jewish History, Travel Experiences on November 26, 2013 by slAdmin. Jewish population in Hungary predates the invasion and conquest of the country by the Huns, or Magyar tribes by as many as 600 years. With some Jewish settlers arriving in 295 ad. This fact is rather mindboggling, considering that the first few arrived as war prisoners, or slaves, when they were brought in as trophies by the warriors sent to squash Bar Kochba’s revolt. Thus began the history of the largest community of Jews in Europe, with their almost schizophrenic roller coaster existence. The persistence the Jewish community exhibited, despite the changing rulers, some of which were Anti-Semitic and encouraged blood libels, is astounding. There were others who embraced the Jews as a valuable contributors to the country’s culture and economy. Some of the rulers, such as Bela IV, put the Jews under Royal protection, an act confirmed by all medieval kings in the new Magyar state. Hungary has become a sort of a safe haven for Jews and they migrated there from more hostile countries. There’s an interesting epitaph to Jews in early 300 a.d. was found in Siklos (by Yugoslavia) refers to Jewishness (“Judaea”). The tablet was inscribed on behalf of the chief of the Spondilla customhouse, referring to the [head of the synagogue of the Jews]” during the reign of Alexander Severus. In 2008, a team of archeologists discovered a 3rd-century AD amulet in the form of a gold scroll with the words of the Jewish prayer Shema’ Yisrael inscribed on it in Féltorony (now Halbturn), Burgenland in Austria. The name Zsido, from the Slavic, was the name given to Jews in Hungary. The first historical document relating to Hungarian Jews is the letter written about 960 A.D. to King Joseph of the Khazars by Hasdai ibn Shaprut, the Jewish statesman of Córdoba, in which he says that the Slavic ambassadors promised to deliver the message to the King of Slavonia, who would hand the same to Jews living in “the country of Hungarin”, who, in turn, would transmit it farther. About the same time Ibrahim ibn Jacob says that Jews went from Hungary to Prague for business purposes. Dr. Samuel Kohn suggests that Jewish Khazars may have been among the Hungarian troops that under Árpád conquered the country in the second half of the 9th century. Nothing is known concerning the Jews during the period of the Vajdas, except that they lived in the country and engaged in commerce there. In 1061, King Béla I ordered that markets should take place on Saturdays instead of the traditional Sundays (Hungarian language has preserved the previous custom, Sunday = vasárnap (meaning Market Day). In the reign of St. Ladislaus (1077–1095), the Synod of Szabolcs decreed (May 20, 1092) that Jews should not be permitted to have Christian wives or to keep Christian slaves. This decree had been promulgated in the Christian countries of Europe since the 5th century, and St. Ladislaus merely introduced it into Hungary. At first they formed small communities and despite having no learned Rabbis, were strictly observant of all the Jewish laws and customs. One tradition relates the story of Jews from Ratisbon (Regensburg) coming into Hungary with merchandise from Russia, on a Friday; the wheel of their wagon broke near Buda and by the time they had repaired it and had entered the town, the Jews were just leaving the synagogue. The unintentional Sabbath-breakers were heavily fined, as per contemporary German customs. When the During the reign of King Andrew II (1205–1235) there were Jewish Chamberlains and mint-, salt-, and tax-officials. This was a short lived Golden age, disrupted by the nobles of the country, demanding the king to deprive the Jews of these high offices. When Andrew needed money in 1226, he farmed the royal revenues to Jews, which gave ground for much complaint. The pope (Pope Honorius III) thereupon excommunicated him, until, in 1233, he promised the papal ambassadors on oath that he would enforce the decrees of the Golden Bull directed against the Jews and the Saracens (by this time, the papacy had changed, and the Pope was now Pope Gregory IX; would cause both peoples to be distinguished from Christians by means of badges; and would forbid both Jews and Saracens to buy or to keep Christian slaves. The year 1240 was the end of fifth millennium of the Jewish era. At that time the Jews were expecting the advent of their Messiah. The Mongol invasion in 1241 seemed to conform to expectation, as Jewish imagination expected the happy Messianic period to be ushered in by the war of Gog and Magog. Béla IV (1235&ndash1270) appointed a Jewish man named Henul to the office of court chamberlain &ndash the Jewish Teka had filled this office under Andrew II) and Wölfel and his sons Altmann and Nickel held the castle at Komárom with its domains in pawn. Béla also entrusted the Jews with the mint and Hebrew coins of this period are still found in Hungary. In 1251 a privilegium was granted by Béla to his Jewish subjects which was essentially the same as that granted by Duke Frederick II the Quarrelsome to the Austrian Jews in 1244, but which Béla modified to suit the conditions of Hungary. This privilegium remained in force down to the Battle of Mohács (1526). Any Christian transacting business with a Jew who was unmarked, or living in a house or on land together with any Jew, should be refused admittance to the Church services and that a Christian entrusting any office to a Jew should be excommunicated. Andrew III (1291&ndash1301), the last king of the Árpád dynasty, declared, in the privilegium granted by him to the community of Posonium (Bratislava), that the Jews in that city should enjoy all the liberties of citizens. It’s easy to imagine the sew saw existance of the community, not knowing from one day to the next what their fate will be. And yet, Jews in other countries fared such atrocities, that Hungary became a refuge. During the extinstion of the Arpad rule, jews were persecuted and in fact were expelled,readmitted and expelled again during the Black Death and once again by King Louis. Some years later, when Hungary was in financial distress, the Jews were recalled. They found that during their absence the king had introduced the custom of Tödtbriefe, i.e., cancelling by a stroke of his pen, on the request of a subject or a city, the notes and mortgage-deeds of the Jews. An important office created by Louis was that of “judge of all the Jews living in Hungary,” who was chosen from among the dignitaries of the country, the palatines, and treasurers, and had a deputy to aid him. It was his duty to collect the taxes of the Jews, to protect their privileges, and to listen to their complaints, which last-named had become more frequent since the reign of Sigismund Luxembourg (1387&ndash1437). The successors of Sigismund: Albert (1437&ndash1439), Ladislaus Posthumus (1453&ndash1457), and Matthias Corvinus (1458&ndash1490) a protector of the jews&mdash-likewise confirmed the privilegium of Béla IV. Matthias created the office of Jewish prefect in Hungary. The period following the death of Matthias was a devastating one for the Hungarian Jews. It was said that his body was still warm when the masses attacked his Jewish proteges, confiscated their property, refused to pay debts owing to them, and persecuted them generally. The pretender John Corvinus, Matthias’ illegitimate son, expelled them from Tata, and King Ladislaus II (1490&ndash1516), always in need of money, laid heavy taxes upon them. During his reign, Jews were for the first time burned at the stake, many being executed at Nagyszombat (Trnava) in 1494, on suspicion of ritual murder. The Hungarian Jews finally applied to the German Emperor Maximilian for protection. On the occasion of the marriage of Louis II and the archduchess Maria (1512), the emperor, with the consent of Ladislaus, took the prefect, Jacob Mendel of Buda, together with his family and all the other Hungarian Jews, under his protection, according to them all the rights enjoyed by his other subjects. Under Ladislaus’ successor, Louis II (1516&ndash1526), persecution of the Jews was a common occurrence. The bitter feeling against them was in part augmented by the fact that the baptized Emerich Szerencsés, the deputy treasurer, embezzled public funds. in the 1500’s sheik Suliman vanquished Louis2 and decided to ditribute the Jews all over the ottoman empire. it seems that under Ottoman rule, the Jews fared much better and during this time worshipped at 3 different shuls, the Ashenazi, Sephardi and Syrian. More turmoil followed but at the death of Maria teresa, whose son Joseph II became king, all opressions against jew were wiped out and they finally became free to settle thruout the country. It was required though that all jews learn Hungarian and that all their documents be composed in eithr Latin or Hungarian, rather than Hebrew or Yiddish.Jewish schools were requested to teach the same material as the rest of the hungarians.In 1978, it was decreed that all Jews should choose a german surname and perform millitary service. The next step was a decision to translate the Pentatuch to Hungarian, all Jews to speakthe country’s language. and some liberal rabbis began preaching in Hungarian.1848-49 Jews have become patriotic fighters and soon were announced as equal citizens, including the permission to intermarry. The liberation was short lived, and after 2 weeks the Russian and Austrian troops punished the jews w heavy taxes but still, the population grew and in 1910 consisted of almost 5% of Hurgary’s total populace. 972.000 jews lived in Hungary, working as bakers and merchants, tailors yet the Neologs tended to embrace the intellectual pursuits, and 48.5% percent of all of physicians were Jews. The Great Synangogue was built in Dohany utca, and it had the odd combination of Kipa wearing Jews having organ play during Shabbath services. The Holocaust wiped out the majority of Hungarian Jews, all the ones living in the smaller regions were exterminated, and the largest community in budapest was largely spared till the end, when the Nyilash movement (according to many, worse than the Nazi’s themselves,) exterminated, sent to labor camps and decimated the the Budapest community to a shadow of it’s former size. 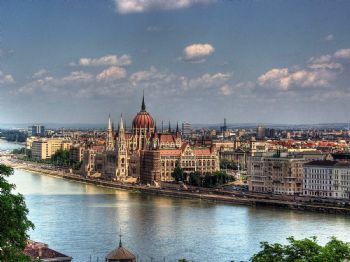 Budapest, one of the most beautifu cities in Europe, is still home to a large Jewish community. It has the renovated Dohany Temple (the largest in Europe) kindergartens, youth groups and a plethera of Jewish Kosher restaurants. The Temples are heavily attended and in a recent visit I witnessed hundreds of people, many of them young couples with kids attend Friday services. The community is flourishing again, and despite outbreaks of anti semitism by the Jobbik party, they fight back with the help of the local Bishop, an opera constructed to raise attention to the ugliness raising it’s head, and the news of the former Jobbik leader, who began observing the Sabbath because he found out of his own Jewish heritage. This entry was posted in Jewish History on November 19, 2013 by slAdmin. A 200 million year old limestone rock, at the southernmost end of Spain, became the Peninsula known as the Rock of Gibraltar. 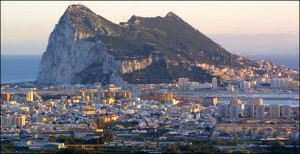 In tiny Gibraltar, 6.5 square kilometers in all, there is culture, history mystery and a vibrant present. With a population of a small town, it’s home to 28,000 people, of which 700 are Jewish. There has been a considerable Jewish presence in Gibraltar for over 650 years, prosperous, influential and politically active. Despite short periods of anti-Semitism during the Spanish Inquisition, it’s considered the most integrated community outside of Israel. Gibraltar boasts 4 synagogues, the oldest of which is Shaar Shamayim, a.k.a. The Great Synagogue. The other three are still functioning every Sabbath and holidays. Several Jews served there in important Government positions, Particularly, Sir Joshua Hassan, who served as Chief Minister of Gibraltar for two separate terms. Solomon Levy served as Mayor of Gibraltar from 2008 to 2009. The city maintains 5 kosher institutions, a Jewish primary school and two secondary schools, with separate girls and boys religious high schools. There’s even a Mikvah, a kosher coffee house. Despite having only 700 Jewish members of the local community, their infrastructure could easily satisfy 2000 or more people. Gibraltar&rsquos largely Orthodox and Sephardic Jewish community has grown substantially in the past decade, increasing its rolls by 25 percent in just the last three years. The Jewish primary school now has a record 140 pupils and recently added a floor of modern classroom space with the help of government funding. Along the way, the community has become more religiously observant and, many say, more insular. There is also believed to be a substantial population of Israelis in Gibraltar who generally don&rsquot affiliate with the wider community. Fueling the growth in part are soft loans of 10,000 pounds ($15,500) repayable over 15 years that were issued by the community to attract newcomers, who arrive mainly from England and Spain. Many, like Jo Jacobs Abergel, who moved here from Leicester, England, are married to native Gibraltarians. Now a mother of three, Abergel laughed as she spoke of being somewhat of an anomaly among Gibraltar&rsquos Jewish women, most of whom cover their head and don’t wear trousers. According to the community members, the place feels like one big family, getting together for smachot and chagim as well as for sad occasions. The formal language spoken in the community is Llanito, a mix of English, Spanish with a sprinkling of Hebrew. The Kosher Cafe Verdi Verdi, opened by a new comer from Israel is chic and elegant enough to belong on the upper West side of Manhattan. Gibraltar&rsquos largely Orthodox and Sephardic Jewish community has grown substantially in the past decade, increasing its rolls by 25 percent in just the last three years. The Jewish primary school now has a record 140 pupils and recently added a floor of modern classroom space with the help of government funding. Along the way, the community has become more religiously observant and, many say, more insular. Also the two largest stores in the open air plaza, filled with boutiques and shops, are the Jewish owned Cohen and Massias Jewelers and the S.M. Seruya Perfume outlet. There are no non-orthodox synagogues in Gibraltar and there’s a slight concern that lately the line between the Jews and the rest of the populace has been drawn a bit too tight. It serves a purpose of avoiding assimilation and being comfortable in one’s Jewish heritage. This entry was posted in Jewish History on November 12, 2013 by slAdmin.